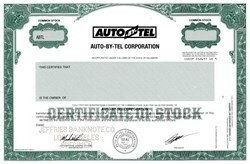 Beautifully engraved specimen certificate from the Auto-By-Tel Corporation. This historic document was printed by the American Banknote Company and has an ornate border around it with a vignette of the Company's logo. This item has the printed signatures of the Company’s President, and Vice President, General Counsel and Secretary. Autobytel Inc., is an online leader offering consumer purchase requests and marketing resources to car dealers and manufacturers and providing consumers with the information they need to purchase new and used cars, pioneered the automotive Internet when it launched autobytel.com in 1995.